Getting in just under the wire for the 2015-16 season, 2016 Panini Instant NBA Finals Basketball follows the recent trend of real-time, print-to-order cards. 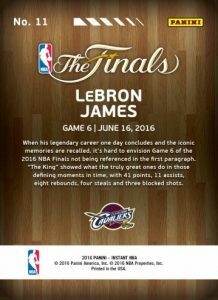 The online exclusive set looks back at the 2016 NBA Finals where LeBron James and the Cleveland Cavaliers beat Steph Curry and the Golden State Warriors. 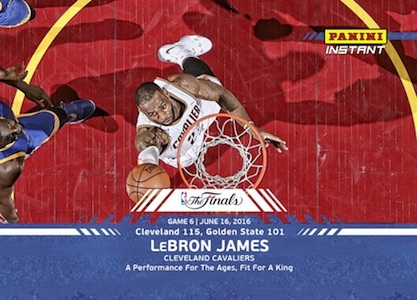 Likely familiar to collectors at this point, 2016 Panini Instant NBA Finals Basketball highlights notable performances and events from the recent past. However, instead of moments strictly from the previous day, these 15 limited cards are from the entire 2015-16 championship series. The exclusive cards are sold though the Panini America Online Store for just 48 hours before they are retired from production. In addition to a base set that is limited to the amount sold during that period, there are also several parallels that up the price and lower the print run. 2016 Panini Instant NBA Finals Basketball includes Green (#/25), Blue (#/5) and Black (1/1) parallels. The Panini Instant brand debuted with 2016 Copa America and was soon followed by Euro 2016. 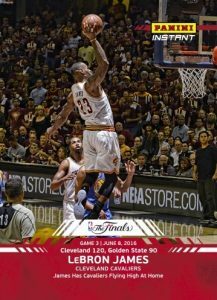 2017-18 PANINI INSTANT #194 KEVIN DURANT NBA FINALS GAME 3 ICONIC SHOT SP 67! 15 cards. Red is the base color. Click on the links below to shop for cards on eBay. 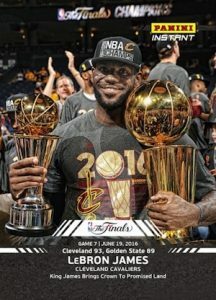 8 LeBron James - Cleveland Cavaliers: James Slams Golden State as Series Heads Back to "The Land"
2015 16 PANINI CONTENDERS DRAFT PICKS BASKETBALL HOBBY BOX - 5 AUTOS PER BOX!! !